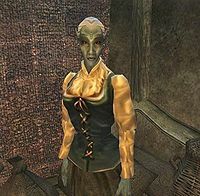 Drarayne Thelas is a Dunmer commoner who has the largest collection of pillows in Balmora, or, possibly, anywhere in Morrowind. She can be found in her house on the east bank of the Odai River in the center of Balmora. She is wearing a common shirt with matching skirt and shoes. She is carrying a pillow and a key to her house. Aside from her natural resistance to fire and the sanctuary provided by her ancestors, she knows no spells. In her house is various clutter items and a copy of the following books: The 36 Sermons of Vivec: Sermon 20, The Cantatas of Vivec and The Anticipations. You'll notice she has a lot of pillows, both in her house and her storage. "Are you the one they sent to take care of the cave rats?" [Storage Key has been added to your inventory] "PCName? Anyway, I've got one trapped in my bedroom here, and the other two are in my storage area upstairs. Rats, that is...not pillows. Here's the key for that door. There are at least three of these beasts. I hope they haven't gotten into my good pillows...."
"Are you going to kill those cave rats for me?" [100 gold has been added to your inventory] "I'll take your word that the cave rats are dead. Here, take these 100 septims. It's what I agreed to pay the Fighter's Guild." "The rats haven't been back yet, %PCName." "A shipwreck? That's horrible! Oh, ll of those wonderful pillows... Well, I thank you, PCName. It is good to know what became of my shipment, though the loss of pillows saddens me. A few of those were stuffed with racer plumes. A real shame. Still, thank you for your help with this. Take this as a token of my appreciation. It has served me well." She then rewards the player with an Extra Comfy Pillow. Exterminator: Exterminate a few cave rats in a local Balmora house. This page was last modified on 23 February 2019, at 22:13.